Who were the ‘winners’ and (possibly the ‘losers’ !?) in 1980’s “British Abstract Painting” then? It was a decade that started boldly enough for abstraction when John Hoyland was asked by the Arts Council to select the Hayward Annual in 1980. Its worth a glance back at the Annual’s history. And worth recalling that in the late seventies the English contemporary art scene (and general public interest in it) was much enfeebled compared to that of the past few decades. Consequently with seemingly fewer opportunities for substantive national or international exposure, backbiting and grumbles were all the more the norm (yes far worse than today!). The annual began in 1977 and the first two years were Committee jobs whilst the 79 offering gave five ‘young’ (ie. under 35!) artists the opportunity to select a like minded grouping each and a curious ‘ancillary’ programme of four video/performance artists. In this 1979 five ring circus abstraction did reasonably well, James Faure Walker, then of Artscribe, was chosen to represent “abstraction” and he put his impressionistic colour fields into the arena with Jennifer Durrant, William Henderson, Bruce Russell & Gary Wragg. (And Nicholas Pope threw in a dose of abstract sculpture too with Richard Rome, Katherine Gili & Jeff Lowe). No matter that none of these first three ‘annual’ shows seemed to impress the critics or the gallery going public that much, probably the fate of almost every ‘survey’ type show in history, but the Arts Council, stung by the various gripes from the earlier iterations thought it a good idea to give over selection to a single artist to choose work, as the AC Director of Art put it “from a position of deep personal conviction”. Hence Hoyland. His selection was an unabashed apologia to abstraction split into the ‘old guard’, established heavies, dead and alive, and a younger generation grouped around those artists operating in the various East London studio complexes. (This latter generation feature substantively in Matthew Macaulay’s exhibition that accompanies his seminar in Coventry). The established group (as Hoyland included Caro, Scott & Tucker’s sculpture) representing a diverse painting practice from figuration in the persons of Matthew Smith, Patrick Caulfield and Frank Auerbach to an equally eclectic mix of abstraction drawing in Ben Nicholson, several of the St. Ives group (Heron, Hilton, Frost & Lanyon) by way of others as different as Hitchens, Hodgkin, Stephenson & John Walker. The ‘younger’ group (quite a number of whom were older than Walker…) whilst exhibiting a breadth of abstraction were more homogeneous and would go on to feature significantly in the art of the decade. Whilst still being dominated by males it did include two (yes two!) 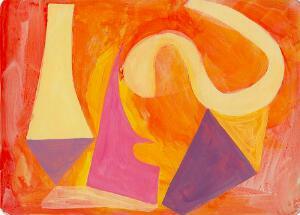 women artists – Gillian Ayres and Mali Morris and one artist of colour, Frank Bowling. A foot (albeit a very small one) in the door. Much of work was large scale, loose and painterly ranging from light staining (John McLean, Morris, Richard James, Geoff Rigden) through to heavier impasto, knife work and mixed media (Gillian Ayres, Terry Setch, Anthony Whishaw, Michael Moon and Michael Bennett). In between there was a deal of vigorous mark making and sloshy brushwork (Basil Beattie, Frank Bowling, Jeffrey Dellow, Brian Fielding, Clyde Hopkins, Albert Irvin, Patrick Jones, Fred Pollock, & Paul Tonkin). There was relatively little in the way of solid clearcut formal organisation other than in the delineation through colour and much in the way of scumbling, all over colour and expressive handling. For a certain kind of abstraction it was a fairly comprehensive grouping albeit missing some obvious fellow travellers (Gary Wragg & Bill Henderson – for example – missing presumably because they had been selected the previous year). But what else was happening in British Art in 1980? Well one place to look is in what we export; the 1980 Exxon International Exhibition (remember Exxon…oh by the end of the decade well dodgy!) British Art Now: An American Perspective is of interest. Selected by Diane Waldman, the show at the Guggenheim, New York featured an eclectic mix of painting, sculpture and photographic work yet all the four painters (Alan Green, John Edwards, Hugh O’Donnell and perhaps (definitions again) we might include Keith Milow were all pretty much resolutely abstract (again whether Milow’s intriguing Cross pieces are abstract might be debatable). On arrival in the US the critics were not especially kind. Some of their criticism, particularly of the painting, centred around the belief that it was a pale reflection of trends in the US and whilst that might arguably have applied to Green and Edwards to some degree it could decidedly not be to O’Donnell or Milow. And also taking place for the very first time the very grandly titled The British Art Show had opened back in December 1st 1979 in Sheffield. Going on through winter and into late spring 1980 it visited both Newcastle & Bristol. Significantly it specifically came nowhere near the capital. Whether or not selector William Packer’s valiant attempt to reflect not only London’s dominance but reach all parts of the nation (nearly…there was nowt from N.I.) was a reflection of, or consequence of, this is a moot point. What was clear (and of course all the exhibits were produced in the late 70’s) was that for Packer at least, abstraction was a significant force accounting (with painting & sculpture) for roughly half the hundred plus exhibitors. Contrast this with the second ‘edition’ of the show (back to a ‘committee’ of sorts again) in late 1984 where abstraction (both painting & sculpture) accounted for less than a quarter of those selected. Packer’s selections brought a host of lesser known abstract painters to a wider audience alongside already established figures. A goodly number of those already mentioned above and those listed below were joined by recognised ‘stars’ like Bridget Riley on the one hand and relatively unknown painters like Michael Mayer (a personal favourite) on the other. The eclectic nature of the mix emphasised by other abstract painters as diverse as Sean Scully and Edwina Leapman (both showing trademark early minimalist all over stripes) and other more eccentric figures several of whom are now much less remembered (such as Harry Snook, Janet Nathan and Will Rogers, all of whom might rightly be considered as makers as much as painters, deploying construction and collage as much as more traditional painting materials) and all of whom deserve greater recognition. Turning to back to other ‘domestic’ issues. Somewhat less lavish than any of the previous shows was a Kettle’s Yard touring show (where it toured I don’t know?) simply titled Paintings and drawings by Martin Ball, Graham Crowley, Jeff Dellow, Clyde Hopkins, Joan Key, Bruce Russell & David Wiseman. It was a self selecting group and they invited Bill Packer to write an introduction to this show too. Packer suggested that even at this early point in their careers, five of the exhibitors were “consciously, if tentatively, (to) embrace figuration”. The painters themselves issued a statement reasserting the art of painting and sculpture and went as far as to proclaim that “there is no need to defy that tradition [of painting as a medium], or to avoid reference to it, in order to achieve ‘New Art’.” Much of the work was characterised by loose or hazy references to either landscape or geometry, there was a good deal of strong colour and plentiful evidence of paint handling. Several of artists (all around thirty at the time) were still evolving their personal languages, indeed the works chosen clearly showed significant movement of this kind. Most of this group were still operating outside of the ‘academy’ as visiting or sessional lecturers and others had only recently taken up tenured jobs. It is interesting to speculate that as they all transitioned to full time posts with the concomitant additional duties (gathering pace as these institutions, already mostly Polytechnics rather than Art Schools, moved towards the University status they would acquire in 1992) on the impact on careers in many cases (something also discussed by Bill Packer in his British Art Show catalogue). Also happening in the summer of 1980 were the Serpentine Summer Shows, an opportunity to view a diverse selection of what emerging talents were working on at the time. This gave valuable ‘prime location’ exposure to a host of artists drawn from across the UK. That summer I saw Terry Setch for the first time, austere yet beautiful minimalist works by John Mitchell & Christine Floyd alongside a diverse mix of other art of all kinds. Something that seems significant looking back is the emergence in the latter seventies of cheaper colour printing. For example, contrasting the two Hayward Annual’s in 79 and 80 the catalogue of the former is exclusively in b&w whilst in 1980 the ‘younger’ group are all represented in colour (albeit a single image). Given the nature of the work this is pretty vital for all the abstract painters. As we shall see there are several publicly subsidised venues and commercial galleries that were beginning to take advantage of these new less expensive colour card and brochure print outfits to the advantage of artists and to painters in particular. Where does one start in a discussion about this subject? Is it even a valid subject at all? For a start what constitutes “British’ in these Brexit times, or even more so back in the 1980’s. At the start of the decade the Royal Academy was still a quarter of a century from electing its first Black artist (Frank Bowling in 2005) but had fully embraced European emigres such as Freud and Auerbach. Identity politics, around Feminism and gender as well as race, were all impacting on the art of the time although the official organs of distribution were still, certainly at the beginning of the decade, indifferent if not ignorant of them. Two speakers on the day (Rebecca Fortnum & Maggie Ayliffe) spoke at length to issues around Feminism and its impact on abstract painting, though in passing its worth noting that much of their eloquent testimony revolved around paintings, and especially exhibitions, from the early nineties rather than the eighties. Perhaps a more blatant omission was any testimony to racial politics and the absence of any people of colour at the event (I’m fairly sure of this though I apologise if I’m wrong) and but a passing visual reference to only one British artist of colour on the day (Frank Bowling again) in a decade when the emergence of the “Black Art’ movement (admittedly short on ‘abstract’ painters) was a key feature of what was taking place. Moving on, as we all know, the term “Abstract’ is fraught with difficulties too numerous to detain us in this lifetime (and certainly within this text) but the notion of boundaries between that which is properly abstract, that which is ‘abstracted’ and figuration, however loosely defined played quite a part in the decade in question. This was raised a couple of times in the day but never really teased out. As it happens most of those painters referenced were ‘abstract’ in that they abstracted from reality (of some sort!, more qualification!) and notions of landscape was a shadowy presence for nearly all of them. There was little mention of painters who might more readily be accepted as truly non-representational (accepting that some of them might allude to ‘real world’ influences anyway) other than in Daniel Sturgis‘s text on Alan Uglow though even here we were teased with the references to football pitch layouts that Uglow enjoyed alluding to. Painting as a term we might all understand a little better but even so by the 1980’s even this had reached myriad points of debate. A good deal of the boundary shifting in painting was taking place in the USA and at the event David Ryan in his opening paper drew a good deal of attention to what was happening there as well as what happened here, including some of those artists engaged in that very practice. And beyond all the foregoing history is, of course, written primarily by the ‘winners’ although we now live in dramatically revisionist times that suggest that, as in previous centuries, time will have a profound say on what shakes out over the long run (the ‘re-discovery’ of Uglow championed by Bob Nickas may or may not prove to be an example). Although, as is inevitable with an open call for papers, the day was full of disjointed and disparate texts there was much to reflect on and the show Matthew had brought together that was the end point of proceedings is well worth a visit. Part 2 to follow! Anyway I’m working on a short piece on the topic…and will post it here as and when…with maybe some thoughts on what transpires on the day. We’ve all experienced those times when making the effort to get to a show is tough. After a round trip to Grimsby (210 miles) another hike down to Coventry as the evening drew in wasn’t favourite. 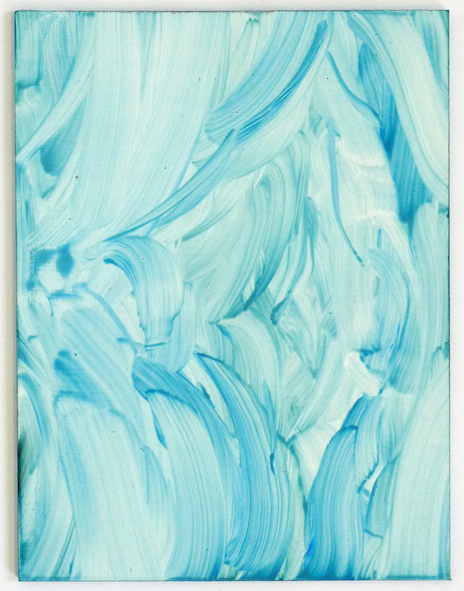 But I really wanted to see Visual Stream, a solo show by the painter Jeff Dellow. And it was a real pleasure. Over recent years I can count on the fingers of two hands (and I see a lot of shows) outings of abstraction by individual artists (they tend to be as rare as hen’s teeth given the predilections of our current curatorships) and fewer still that give one the rarer still feeling of complete satisfaction and – joy – an extremely precious commodity in the contemporary art world. It’s the first thing that comes at you in this well selected (by fellow painter Matthew Macaulay) show that presents a small selection of Jeff’s little panel paintings and a goodly number of the larger canvases is a joyfulness and playfulness in the opportunities that abstraction offers. And the colour palette is as joyful, vibrant, diverse and equally as exuberant as the handling. There are a range of tropes at work of course, but these are varied and diverse…just sufficiently repeated to bring the stylistic consistency to the whole but never dull or lazy. Every so often you spot another, different and original painterly handle, a flick of the wrist, a smear, another kind of grid played off against a box or a plane, and so on. An endless variation of the painters thinking, an expansive repertoire based on quite a few decades of concentrated looking and absorbing what paint can do and how it can be deployed without resorting to mimesis. There is deep time locked into these pictures, that despite their alarming freshness, also embed a lifetime of intensity in the consideration of abstraction. The show runs in the Lanchester Research Gallery, in the Graham Sutherland building on Cox Street, Coventry until 2nd February 2018 – if you care about abstract painting in the present you need to get along there! It was a real pleasure to get into the studio today…not only did I resolve two of the large Conversation pieces to my satisfaction but I was able to take receipt of this generous gift of a painting by Arthur Goodwin. It came to me very fortuitously from Jill Langford to whom I am so grateful. Arthur was Vice-Principal at Exeter College of Art up to and including the period I spent there on Foundation studies. His son Paul and myself studied together in the art room at Hele’s School Exeter overseen by the wonderful teacher and distinguished sculptor Peter Thursby. I happened to mention this to Jill on a visit to her home a few years back…she is moving and downsizing so her collection requires a bit of pruning and she recalled our conversation and offered me this choice cutting! At the time I first saw it it was late and quite dark at her home…now I can study it carefully in good light it is particularly interesting to see that the work is painted on a cupboard door. One of the things about the picture I particularly like is the way in which the wood and its grain is used to good effect as both ground and surface incident. Interestingly I saw another work a year or so back in my curated show ‘Painting Too’ by Mathew Macaulay that in some ways provides an echo of this work..painted on a reclaimed timber with very loose painterly handling. 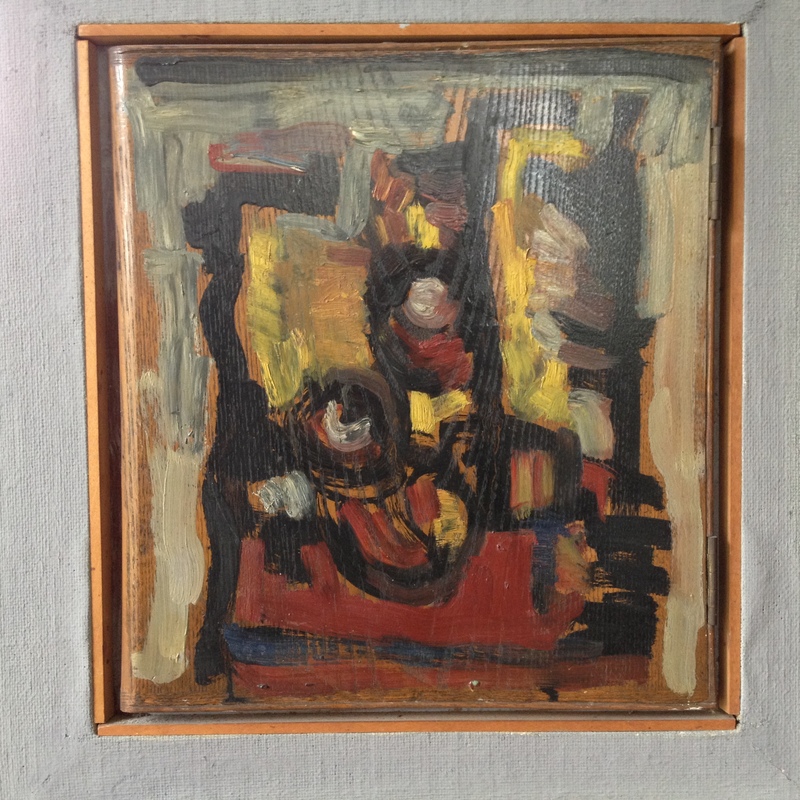 Arthur painted his picture in 57/58 , under the influence of post War School of Paris though no doubt with a nod towards Abstract Expressionism from the States that was relatively still unfamiliar in those days in the UK. Matthew’s work was painted last year but I suspect the influences have similar echoes overlaid with a contemporary sensibility – another example for me of the inter-generational interaction I recently wrote about here. 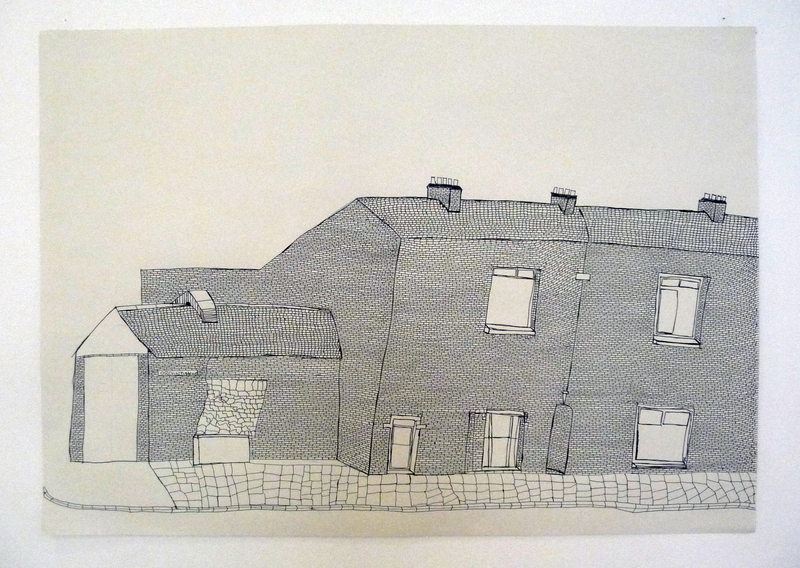 As I’m participating in the upcoming ‘Pareidolia’ show at Matthew Macaulay’s Pluspace in Coventry I had occasion to visit last weekend that gave me the opportunity to view David Beaumont’s Drawings. I curated a show of recent large scale drawing last year at Harrington Mill and in my introduction suggested that “Drawing is paradoxically both better and worse off than it has ever been. As the first way in which humans made sense of their surroundings visually it remains central to the idea of our visual culture, at the same time the advent of technology has made it – for many artists – utterly redundant. It features rarely in many contemporary art events.” So it is refreshing to see an artist at work for whom drawing is the process and the product of his creativity. That the subject of the work is a careful, indeed almost forensic, examination of his surroundings is also fairly surprising, much of the drawing activity I have recently seen by younger artists tending to be process driven. The exhibition features a dozen or so of his recent output. Most of the subjects are probably recognisable to those who frequent the streets depicted on a regular basis but the show explicitly doesn’t reveal location except by occasion reference to signage. This is I suspect to serve not to distract the viewer from a careful inspection of the topography of each location. The construction of which is quite calculated and painstakingly accurate. Indeed the work has a meticulousness that betokens the level of sophistication at work here. Evidence of the working out of placement and the heavily invoked selectivity of the angle and cropping set against the demands of the papers edge are testament to the creative vision of the artist. Another striking aspect of these drawings is the beautiful use of negative space and the signifier of blankness that is a feature of windows and other apertures in each of the works. Such careful and considered deployment of the light that is occasioned by the heavy working of line around these punctures in the image is yet further indication of their specialness. So much contemporary practice (across the so called ‘expanded’ field of painting, drawing and sculpture) is dependent on gesture, on the ‘casual’ or provisional that something like a Beaumont drawing that is so rigorously planned and executed comes as something of a shock. But its a really good shock and one that, in his case, one can look forward to seeing more of. It’s very rewarding to be a part of these shows…this one created by the energetic and very able Matthew Macaulay…that are carefully created to bring together work that shares a certain personal ‘vision’. The result is that you can find yourself showing alongside artists of tremendous variety – certainly as regards age, gender and backgrounds – but with some characteristics that you recognise in your own work. Given that I’ve been working for many years it occasionally surprises me that artists that I’m old enough to be the grandfather of (just I should add…) share some interests in painting that I do! Whether that says something about me or them I’m not sure – but I hope it says something about the rude good health of the ‘tradition’ of non-objective painting despite the climate in the subsidised visual arts community in the UK. That it takes enterprising and self effacing talents like Matthew to do these things without evident financial reward is sobering but heartening. It shows that the things one cares passionately in are in good hands in the generation coming through right now. If you can take a trip over to Pluspace – it sits just around the corner from the Bishop Street car park in the centre of Coventry.